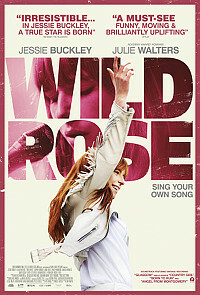 Jessie Buckley storms the screen in this vibrant Scottish drama about a young woman with country music in her veins. Not only is her performance enormously involving, but the film itself cleverly reflects her character's journey from chaotic, pent-up energy into something genuinely sublime. It's written and directed with skill, and the entire cast is excellent. But this is Buckley's show. At 23, Rose-Lynn (Buckley) has been granted parole after a year in prison, and she heads home to Glasgow almost as an afterthought to see her mother Marion (Walters), who has been caring for her 8-year-old daughter and 5-year-old son. Rose-Lynn has never come to grips with being an adult, let alone being a mother, but she gets a job cleaning the home of the well-off Susannah and Sam (Okonedo and Sives). And Susannah takes an interest in helping Rose-Lynn pursue her natural talent as a country singer in Nashville. This may feel naggingly like a feel-good obscurity-to-stardom movies, but it continually wrong-foots the audience. Rose-Lynne's self-absorption and inability to wrestle herself into control are startlingly nasty, but she's also so deeply layered that it's impossible to give up on her. She sports a prominent tattoo of her country music mantra "Three chords and the truth", which may seem obvious, but the plot and characters never take the easy route. And the soundtrack is packed with wonderful songs curated and written by British composer Jack Arnold. Buckley has such a restless inner energy that Rose-Lynn manages to be funny, awful, gorgeous, hideous and jaw-droppingly gifted at the same time. She continually adds light and shadows that make the character far more complex than these kinds of movies usually get. And her singing is piercingly gorgeous. Meanwhile, Walters and Okonedo make the most of their beautifully written supporting roles, offering engaging, darkly rounded performances. It's rare to find a film with three such nuanced female leads who aren't defined by men. As the story continues, it continually takes its clues from country music, leading to a climax that veers sharply from what most viewers will expect. Both Taylor's script and Harper's direction find real honesty in each scene. And where the story goes is both profound and elegant, with a finale that brings together all of the tears and goosebumps the cast and crew can muster. But this isn't just a crowd-pleaser; it's a terrific exploration of people who dream so big that they risk missing the wonders of life around them.